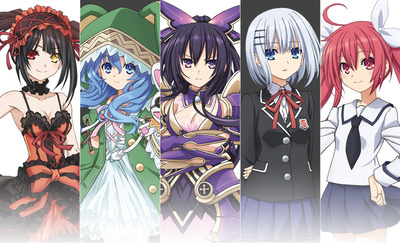 Just recently, the official website created for the animation project of Date A Live was opened. This science fiction romantic comedy is a light novel series created by Koshi Tachibana. Alongside its opening, the website has also revealed the staff and the main cast which will be included in the anime. The series follows the life of Itsuka Shidou. He opens his eyes on the tenth day of April, realizing that yesterday was the last day of spring vacation. This morning is another school day, and he is awakened by his cute little sister. He thought it will be another normal day, when suddenly, a shockwave came and the town vanished—leaving no trace. There was a huge crater in the corner of a street, and he finds a girl. This spirit, known to be the tragedy that will end humanity, is a being rejected by the world and whose origin was yet unknown. There are only two ways to preventing her from ultimately destroying the world; for her to be annihilated, or conversation. Shidou’s little sister Kotori advises him to date the girl and make her fall for him! Japanese studio AIC PLUS + will be doing the production, directed by Getbackers and Jormungand’s Keitaro Motonaga. Hisashi Saito of Heaven’s Lost Property and Haganai will be the visual director, while Hideki Shirane (Queen’s Blade: Rebellion, Hayate the Combat Butler) will be in charge of the series’ scripts. Takaaki Suzuki of Last Exile and Strike Witches, will be advising pertains on the world setting—to which he has done other anime adaptations and manga projects. Satoshi Ishino (Nogizaka Haruka no Himitsu) will be designing the characters taken from the original novel illustrations by Tsunako. The mecha illustrations will be handled by Galaxy Fraulein Yuna’s Mika Akitaka, and Go Sakabe, who handled Gosick theme songs, will be scoring the soundtrack along with the help of Yasunori Ebina, the sound director of Naruto and A Certain Magical Index. Sweet Arms is said to be contributing the series’ opening theme song.